Last week, one of the new young stars of tennis, Naomi Osaka captured the U.S. Open Women’s Singles title with a convincing 6-2, 6-4 win over Serena Williams. But her victory was overshadowed by a controversial sideline match between Williams and the chair umpire. The match left many wondering what just happened?, including myself. But I hope there is something to be learned. This series of unfortunate events underscores the disparity between how men and women are treated under similar circumstances. With $3 million at stake at a Grand Slam match, for a game to be taken from Serena Williams because she called the umpire a thief is an egregious abuse of power. I can’t imagine a similar result if a male player had uttered the same words. And she’s right. It’s was too easy for the umpire, who faced no consequences, to keep his emotions in check. He simply slapped on another punishment as a retort to anything Williams said, as if to teach her a lesson. But that’s not the lesson that millions of fans and viewers learned. Instead, we saw one of the worst examples of sexism in sports. 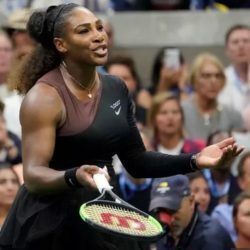 In response to the controversy, The Women’s Tennis Association stated that the WTA believes that there should be no difference in the standards of tolerance provided to the emotions expressed by men vs. women and is committed to working with the sport to ensure that all players are treated the same, adding that they do not believe that this was done during that match. Whether or not you condone Williams’ or the umpire’s actions, it’s important to recognize the underlying issue. Girls and women must be able to use their voices to stand up for themselves in a world of equal standards. Equitable treatment on and off the courts. Finally, kudos for the display of sportsmanship between the contenders and for the support Williams showed Osaka. My heart goes out to Naomi Osaka, whose victory was bittersweet. Hopefully we can all refocus our attention to praise the awesome young superstar. Chair umpire Carlos Ramos accused Williams of illegally receiving coaching during the second set, which is not allowed during Grand Slam matches. Williams denied the accusation and prevailed upon the umpire with an emotional outburst, calling him a thief, demanding an apology. Later, her coach admitted to using an illegal coaching gesture, but it’s unknown whether Williams was aware of the gesture, and she flatly denies it. Nonetheless, those actions plus one smashed racquet cost Williams $17,000 in fines ($4000 for being warned for coaching, $10,000 for verbal abuse, and $3000 for breaking her racket.) Moreover, she lost a game point to the violation, and the escalation of violations resulted in an automatic game loss. Fans weighed in with support for Williams and a chorus of boos in protest throughout the post-match awards presentation, dampening the victory for Osaka. She lowered her head and wiped tears from her face as the opportunity to celebrate her life’s dream was trumped by the sideline drama. Williams consoled Osaka with words of encouragement and put her arm around her. During her turn at the mic, Williams said, “Let’s give everyone the credit where credit is due, let’s not boo anymore.” Osaka, graciously accepted the trophy and said, “I’m sorry it had to end like this,” then expressed her gratitude for the opportunity to play against Williams.